Hey there! Thanks for dropping by natural autonomy N/A! Take a look around and grab the RSS feed to stay updated. See you around! The New Zealand Labour Party just showed voting is not about democracy but their bureaucratic privilege, not about principle but only corporate power. The 2016 local elections confirmed Labour corruption as the greatest non-natural hazard to New Zealand communities – the adjunct reflection of Tory corruption, bogus presentation of empty alternative. This truth makes them unelectable, ever again, and explains declining voter turnout and resident disengagement: Labour deviously monopolises community politics for any and all available wins to their spirit-crushing machine. Communities will not find ways forward – out of increasing corporate control, unaffordable housing, loss of natural environment and growing natural hazards – except through electorally smashing the NZLP then starting over again in communities’ interests instead. 2017 is almost soon enough for this essential project. Various fake lefts tell you otherwise, to try choosing Labour again to displace National, but let us look at facts. The Christchurch public has only quietly been informed that their new Papanui ward councillor is actually the returning mayor’s son-in-law. So you have to ask whether proper prior knowledge of this would have affected the outcome: Mike “Davidson said he did not believe his family relationship with Dalziel would change how he operated as a councillor” – yeah, right? Davidson is now part of a highly dominant, dynastic centrist bloc. Labour-rort government only gets worse the harder you look at it. Potter’s Labour-dominated board had withdrawn all support for KNZB in 2015, to spitefully and corruptly prevent one Board member from ever working with it. This officially appointed SHCB KNZB rep had to pay their own way to the national KNZB conference in Christchurch that year, with zero Board support. By comparison, Potter claimed an all-expenses, disability-enabled long weekend hotel trip to Waitangi, Bay of Islands, for the LGNZ conference in 2014 – a privilege of high office with Labour. The SHCB KNZB rep was the only SHCB member who attended every one of the SHCB 2013-2016 term meetings, working diligently. The corrupt ouster and takeover of all SHCB seats in 2016, using paid council staff to reinforce Labour local power, is already part-documented here: riktindall.wordpress.com/2016/06/06/corporate-fascism-at-ccc-sampson-to-resign-christchurch-city-council-nzlabour-nzpol-newzealand-politics/. An update is here. So to the Environment Canterbury (ECan) part-election of 2016.
a) How much ECan money has Working Waters Trust ever received – by date and amount? b) What ECan staff are or have been a part of Working Waters Trust? If there are material answers to these questions then electoral fraud has just been conducted by the NZ Labour Party. 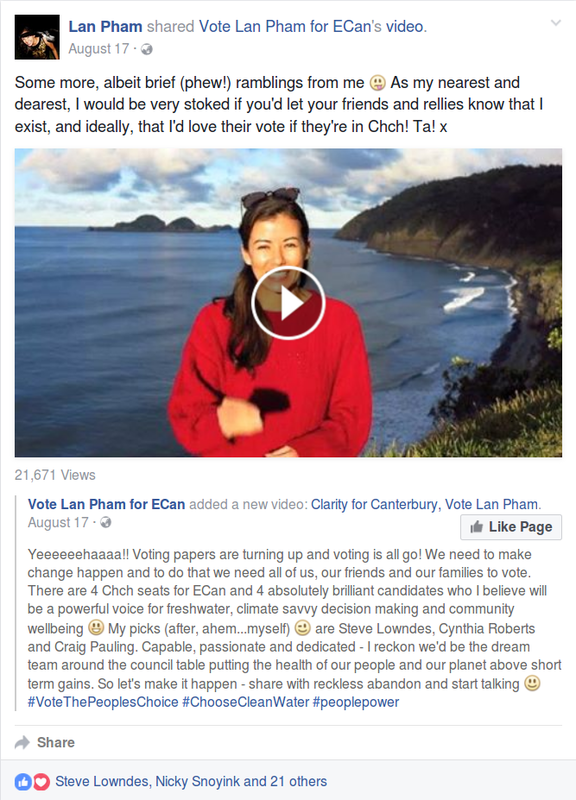 Because the director of Working Waters Trust, Lan Pham, has just been elected to ECan councillor on Labour’s behalf – perhaps using rate-payer resource. We need to know. Is this council staff or contractors determining public representation?! A shocking corporate turn of events. Pham’s call here, over which four ECan candidates voters should choose – to NOT support representation from the deposed ECan council – advantaged her Labour-backed team by splitting the vote such that all three People’s Choice candidates then gained election. 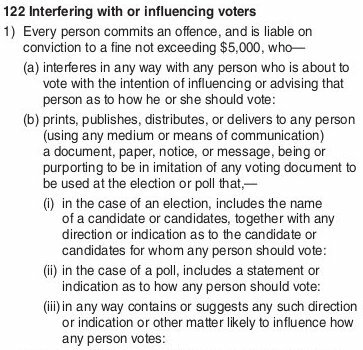 And, it was highly illegal to have influenced voters in this way. Pham’s electoral offence is described at left here, from ECan candidate handbook p.31. Lan Pham is therefore a false democrat, undeserving of an elected public role, at the least for this published prejudice. Pham’s campaign action, on behalf of ‘the firm’, shows precisely why Environment Canterbury is so disliked and so distrusted by so many people. e.g. “Cattle in Christchurch river were on Canterbury regional council’s land”, 12 October 2016 – stuff.co.nz/environment/85202980/cattle-in-christchurch-river-were-on-canterbury-regional-councils-land – The many false democrats who have ‘liked’ this electoral offence is equally revealing. Labour’s dirty tactics, in replacing community reps with council staff or contractors, is to achieve one thing only: corporate monopoly at local political level. Never to listen and share or to innovate, never to allow a community voice. Always to dictate. In the ECan case it is to dishonestly claim back leadership in clean-water activism where they had lost it, quite rightly, in 2007. Labour is fully responsible for irrigation and intensive farming development in Canterbury and its polluting effects. And they know it. Rotten fouls like this, like Lan Pham’s here, are futile attempts to recover the Labour reputation and to overtly cover their highly polluting tracks. Lowndes’ electoral offence is described at left here, from ECan candidate handbook p.17. Confirming that Labour now conveniently sings from the Tory songbook, in its criticism of the 2007-2010 elected council that echoes National’s lies, Rod Cullinane, for Fish & Game (the farmers of the rivers and lakes) claims “the internal disarray was untenable” at ECan in this interview: stuff.co.nz/the-press/news/84590193/the-issues-what-do-the-ecan-candidates-think. From this identified basis of bias, misrepresentation and outright lying, we can understand exactly what the minority local vote of 2016 represents. No one else, with an honest brain, believes in the local governance. Myth-makers rule. 38.29% of eligible voters had a say on ECan and 38.34% on the Christchurch City candidates. Thus, having understood the Christchurch 2016 vote in detail – what it represents and what largely drove it – we know precisely what governs our day-to-day lives. We, the people, strongly need local ethical upgrade and the ability to contribute, for moving forward. http://www.stuff.co.nz/the-press/opinion/85144199/chris-trotter-democracys-disappearing-hand is Labour local hegemony. Thank you Rik for highlighting these disgraces to democracy. Local body politics in his area is a joke. I voted but wish I hadn’t. From the collusion between Clearwater (Labour) and Scandrett (so-called Independent but really Labour) to the ineffective Community board members who regain election no matter their performance. And a mayor who achieved zero in her first term is resoundingly reappointed. Sad. Thank you David for the feedback. 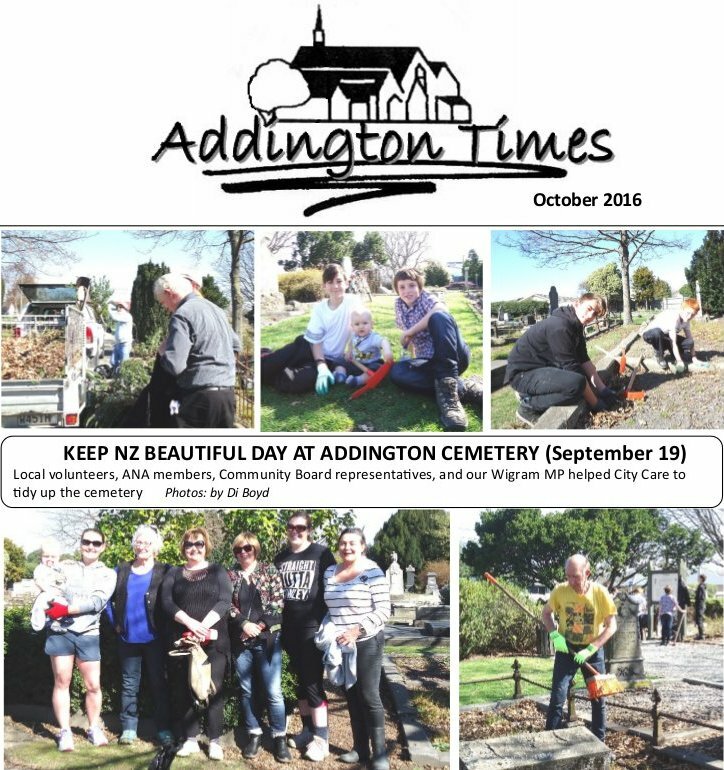 Note, sections of the post being expanded..
Killer #JohnKey walks scot-free? #SDC #CCC stop #ECan #CDEM fighting #PortHillsfire in #Christchurch #Canterbury #NewZealand. 1 life + 9 homes lost. A #CTV repeat. RIP. Those deep in religion do not #understand #religion. Let me explain. Friendly #science. Towards #peace.